My grandfather's barn. 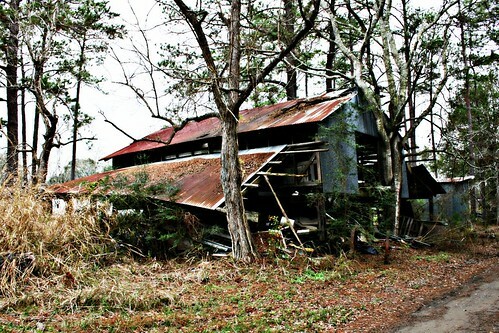 December 2008, Sulphur, Louisiana. I've always enjoyed photos of old structures that have fallen into extreme disrepair, but still exhibit the character and workmanship that are rare in today's modern world. Here in South Louisiana, cypress was the lumber of choice because it resistant to insects and rot. Because of its durability, you can find many old structures that have stood the test of time...and hurricanes. Now that I'm exploring the world of photography I have learned that old, abandoned structures in rural areas are often referred as "rural decay", especially if you visit the Flickr photo-sharing website. (If the structure is located in a city or metropolitan area, it is referred to as "urban decay"). Here are my recent contributions to the rural decay photography populous.